The British Chamber of Commerce (BCCJ) held a Great British Garden Party together with the British Japan Society (JBS) and the Tokyo Chamber of Commerce and Industry (TCCI). This year’s event was attended by over 300 members, and was held on the rooftop terrace at the exclusive and stylish Andaz Tokyo. Thankfully the weather was glorious, so as well as enjoying the beautiful views not only of Tokyo Tower and Mt. 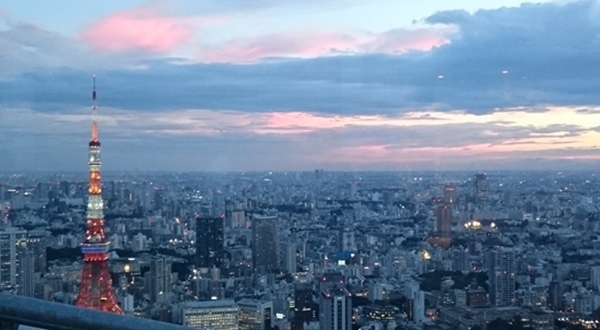 Fuji, guests were wowed by the sunset and the beautiful blues and pinks that descended on the expanse of Tokyo city. Guests were encouraged to dress in their best red, blue and white or floral patterned outfits to fit this special occasion, and even the flower arrangements matched the dress code. Various British favourite dishes were served and some lucky guests were presented with British gifts and delicious looking-goodies. Many thanks to the Andaz Tokyo and the BBCJ for their wonderful hospitality – and we look forward to their next exciting event.